A week of fun in-the-sun while learning new skills and making lifelong friends! Great sports ♦ Lifelong Friends ♦ Fun in the sun! Do you want to improve your game and make new friends? Come, play some basketball and have fun. Our intention is to create the lifelong habit unites sport training, physical effort, friendship, discipline, respect, ambition and exchange of different culture and customs. The campers will not return home as "world champions" but they surely be rich in technical and tactical level of basketball knowledge. Furthermore he/she will be enriched by the experience useful for their future sport and personal careers. The campers will live and share a wonderful experience with excellent program tailored to the specific personal abilities, age and experience of each participant monitored by educated trainers and with professional attitude of camp staff. streching coached by profesional trainer. The campers will be divided into three age groups which will work according to specially adjusted program. Communication on the Camp is in ENGLISH LANGUAGE. 21:15 - Projection of sports films and fun. *It's adviceable to register early because of limited accomodation capacity. 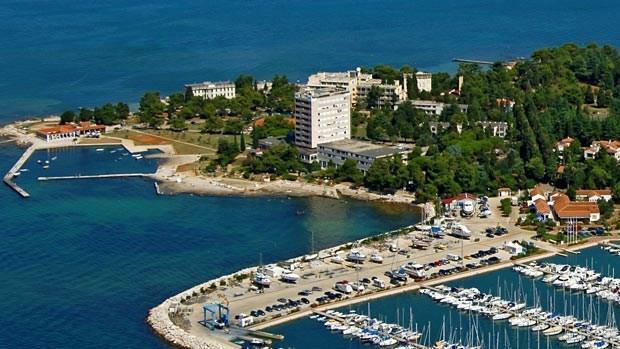 Camp participants are placed in Hotel Adriatic in Umag, with full board. Rooms are double,triple or quadruple and the hotel is situated close to the sea. Exellent program tailored to the specific personal abilities, age and experience of each participant monitored by educated trainers and with professional attitude of camp staff, supervised by the camp director Mr. Aramis Naglic, who has national and international reputation as one of the key players of croatian 'golden generation'of basketball players, and whose team won the silver medal in 1992 Olympic Games in Barcelona. International coaches and basketball players who will be active participants and presenters of short lectures. Dino Radja, Leon Radosevic, Sinisa Stemberger, Drazen Bubnić, Davor Kus, Jasmin Perković, Velimir Perasović, are just some of the names who visit the camp during the training process. The professional staff: senior physiotherapist, physicall education trainer, doctor.